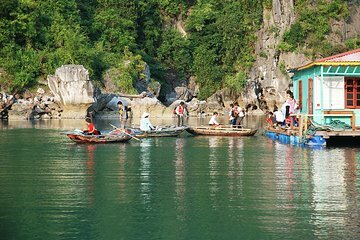 Explore Halong Bay and the Tonkin Gulf on this 11-hour tour from Hanoi. Cruise the scenic waters on a traditional wooden junk, passing floating villages and opting for a bamboo row boat ride or a kayaking expedition. Lunch, snacks, entrance fees, and round-trip transportation from your Hanoi hotel included. The cruise itself is short and sweet. The description isn't necessarily as grand as an experience as you think. For us, we rated the cruise a 2/5 because 40 was stolen out of our bags that we took with us on the boat. When we arrived at Halong Bay, everyone scurried off the boat and we tried to ask the tour guide whether we should bring our bags or not but they sped off. We then tried to ask the bus driver if they were going to stay with our bags and he motioned us to take our bags from under the bus, so we did. He didn't speak English, so we assumed we should take them. We had messaged Viator ahead about if the boat tour would have space for our bags and they replied we could bring them on. We were going to Hai Phong after Halong and would be going our separate way after the tour. We don't feel it was irresponsible for us to have taken our bags. Our bags were locked, however we noticed the staff watching us while we rummaged through our bags. My wife had to change her clothes because the wind was very strong. We had a separate pouch with the keys in it to the locks. You end up going on 2 excursions, leaving the boat. Each time, she told me it appeared the bags had been moved but I thought it was due to the boat rocking back and forth. We arrived at our accommodation and instantly noticed the money was gone. We had 100 in U.S. money we kept intentionally for the Laos border crossing. When we contacted Viator, they merely said they were an intermediary company and could not offer any help. Except to insinuate we must have lost track of the money we had spent that day and so forth and so on. They would not offer any assistance and we will never book with this company again. They should have made some effort to make this theft right. Instead, they did nothing and sided with the company we toured with. The 40 loss was a nightmare to replace and we ended up having to find an American that would exchange Vietnamese money for 20 U.S. that's all they had on them and when we arrived at the border, we didn't have enough money. Very good. 7 people on the minibus and 3 more joined on the boat who must have found their own way there. Excellent food and I hate seafood!! Couldn't believe the size of the boat for just 10 passengers. It could have carried 50. Would have liked longer in the bay but then if that's the case, book an overnight tour.